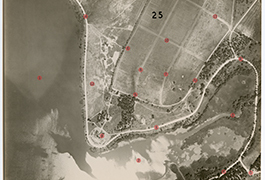 There are 37 pairs of images in the White Rock Lake Aerial Photographs, 1927 Fairchild Survey digital collection that were taken by Fairchild Aerial Surveys for Dr. Samuel G. Geiser. 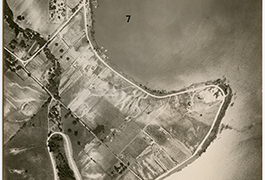 Except for an overview aerial of the lake and surrounding area taken in 1926 at an altitude of 18,000 feet, the photographs were taken from an elevation of 4800 feet in 1927 and feature many popular recreational sites and other notable areas of the lake. 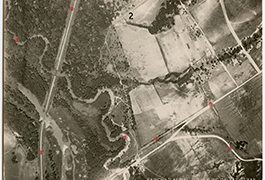 The aerial survey collection is held by SMU's DeGolyer Library. Regional historian George Cearley identified important features in the photographs such as major roads, railways, and landmarks. In the digital collection, there are two versions of each image, labeled and unlabeled. Labeled images include George Cearley's annotations, which appear below the image. To view an individual high resolution image, click on the area near the numbered circle on the map to the left. When you do so, you will be taken to the web page for that image that contains the high-quality, labeled aerial photograph with red markers and a corresponding list of places. Place names are displayed in the metadata field called Labeled Features below the image. To zoom in and move around, use the tool bar across the top of the image. The small image to the left will tell you what part of the photograph you are viewing by displaying a shaded red area around the portion of the image you are viewing. Each image includes links to the labeled or unlabeled version of the photograph. White Rock Lake, which originated as a city project, was commissioned to provide water to the growing city of Dallas. City officials began purchasing land around White Rock Creek in 1909. Winding branches of White Rock Creek are visible in Grid 02, Grid 03, and Grid 13. The dam and pump station, seen in Grid 11, Grid 12, and Grid 35, were completed in 1911. Due to drought, however, White Rock Lake did not fill up until 1914. It eventually became a popular recreational destination, but the lake was closed to swimming in 1933 when it was appropriated for use as a water source. White Rock Lake was never reopened for swimming, but the trails are still used today. Also visible in Grid 35 is the White Rock spillway, an ever-popular spot for visitors even today. William Doran, city Commissioner for Streets and Public Lands, oversaw negotiation and acquisition of 2,292 acres from local landowners for construction of the lake. 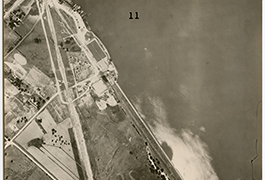 Doran's Point, depicted in Grid 19, was named in his honor. Dixon Bay, another popular site on White Rock Lake, is seen in Grid 26, Grid 27, and Grid 28. 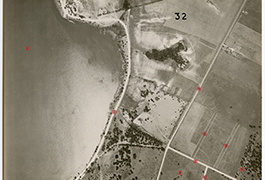 Although Dixon Bay was a popular site in 1927 when the photos were taken, it is almost completely silted in today. Several private boat houses are visible in Grid 11, but by 1952 they had been removed because patrons felt their presence reduced access to the lake. 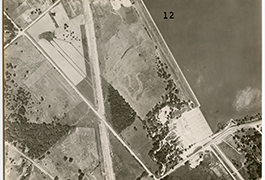 The future site of the DeGolyers' lakefront estate, Rancho Encinal, is visible in Grid 34. The estate was later purchased by the City of Dallas and developed into the Dallas Arboretum. Source: Sally Rodriguez, Images of America, White Rock Lake, 2010, Arcadia Publishing.